Leather Chaps are to keep legs covered and warm when riding Motorcycles or other outdoor vehicle blocking the wind. Leather Waist Band holds the Leg covers up and is adjustable with buckle and strap in front and laced together in back to loosen and tighten. Vest leather and denim have pockets and are good holding body heat and protection.. Patches are popular putting on vest. Vest extenders are for adding to front to keep open. 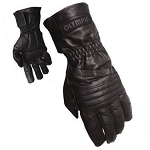 Gloves to keep hands warm and protected in various styles and price.